Though boring to some, our products are truly a no-frills products that have your health at heart! Take a look at some of these super nutritional and health functional ingredients that are carefully balanced and incorporated throughout our products – from Boring Oats to Boring Porridge. And you might be surprised, but we don’t skimp out on the good stuff by adding only a “pinch or dash” either – that would make it too boring. After all, how healthy and balanced your diet is only as good as the ingredients you consume so have a look yourself. Flax is a blue-flowering crop grown on the Canadian prairies for its oil-rich seeds which are tiny, smooth and flat and range in colour from golden to reddish brown. The consumption of flaxseed seem to significantly reduce total cholesterol and the “bad cholesterol,” low-density lipoprotein (LDL) cholesterol, in people with normal cholesterol levels and in men and pre-menopausal women with high cholesterol. Eating low fat foods, increasing your exercise, limiting the salt, sugar and eating flax seed daily are a few ways that you can win the battle against high cholesterol. It has been discovered that the omega-3 fat and high fiber in flax may play a role in the fight against diabetes. Studies have show that flax seeds can possibly be effective for lowering hemoglobin A1c, a measure of average blood sugar level over three months, in people with type 2 diabetes. 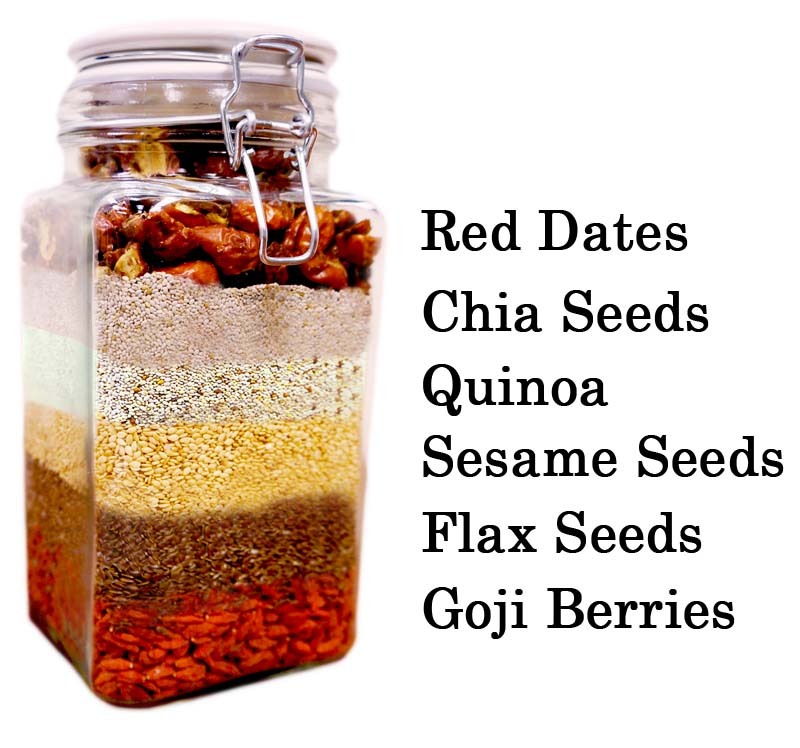 Researchers have demonstrated that giving women one or two tablespoons of ground flaxseed each day significantly lowered circulating estrogen levels. Lignans in flax might also inhibit the action of enzymes that are involved in body’s production of estrogen. Keeping balanced levels of blood sugar is important for both health and energy. Blood sugar may spike after meals leading to ‘slumps’ in your day where you feel tired and out of energy. By balancing your blood sugar, you not only lower your risk for type 2 diabetes, but you also ensure steady, constant energy throughout your day. Chia is the richest plant-source of this healthy oil. Omega 3 oil is important in heart and cholesterol health. Just like Omega-3s, adequate Omega-6s are needed for healthy human living. But there has to be a balance of Omega 6 and Omega 3. While nutrition experts say a healthy ratio of Omega-3 to Omega-6 in a diet ranges between 1:1 and 1:3, the typical Western diet has a ratio of up to 30X the amount of Omega-6 than Omega-3 (a ratio of 1:15 to 1:30). Chia seed, on the other hand, has a ratio of 1:3, which means it has three times the amount of Omega-3 than Omega-6 in its structure. By adding chia in your daily diet, you will balance out the ratio of fatty acid intake, leaving you with a healthier brain function, cardiovascular system, and oxygen satura-tion. The combination of complete protein, vitamins, minerals and blood-sugar balancing gel all work together to make sure you have steady, never jittery energy. Sesame seeds may be the oldest condiment known to man dating back to as early as 1600 BC. Not only are sesame seeds a very good source of manganese and copper, but they are also a good source of calcium, magnesium, iron, phosphorus, vitamin B1, zinc and dietary fiber. In addition to these important nutrients, sesame seeds contain two unique sub-stances: sesamin and sesamolin. Both of these substances belong to a group of special beneficial fibers called lignans, and have been shown to have a cholesterol-lowering effect in humans, and to prevent high blood pressure and increase vitamin E supplies in animals. Sesamin has also been found to protect the liver from oxidative damage. Last but not least, Sesame seeds had the highest total phytosterol content. Phytosterols are compounds found in plants that have a chemical structure very similar to cholesterol, and when present in the diet in sufficient amounts, are believed to reduce blood levels of cholesterol, enhance the immune response and decrease risk of certain cancers. Phytosterols beneficial effects are so dramatic that they have been extracted from soybean, corn, and pine tree oil and added to processed foods, such as “butter”-replacement spreads, which are then touted as cholesterol-lowering “foods.” But why settle for an imitation “butter” when Mother Nature’s nuts and seeds are a naturally rich source of phytosterols—and cardio-protective fiber, minerals and healthy fats as well? Quinoa grains contain essential amino acids like lysine and good quantities of calcium, phosphorus, and iron. quinoa has become highly appreciated for its nutritional value, as its protein content is very high. Furthermore, it is a good source of dietary fiber and phosphorus and is high in magnesium and iron. Quinoa contains dietary fiber and is a source of calcium; making ituseful for vegans and those who are lactose intolerant. Quinoa is also gluten-free by nature and considered easy to digest. Goji berries play important roles in traditional Chinese medicine , where they are believed to enhance immune system function, help eyesight, protect the liver, and improve circulation, among other effects. Goji berries are sweet in taste and neutral in nature; they act on the liver, lung, and kidney channels and enrich yin. For their weight goji berries have more vitamin C than oranges, more beta carotene than carrots and more iron than steak. Beta carotene is believed to help fight heart disease and also protects the skin from sun damage. And, as if protecting your heart, skin and immune system weren’t enough, beta carotene and antioxidants are thought to help fight cancer. Goji berries are also a good source of B1, B2, B6, and E vitamins and antioxidants, which protect against harmful free radicals that damage cells in your body. They’re also rich in polysaccharides, which aid the immune system, have 18 kinds of amino acids, and have 21 trace minerals (including iron, copper, zinc, calcium & selenium). According to historical statistics, the red date is a special species with a long tradition and a high reputation in its birthplace of China. Archeologists have found the fossil of a date core in the cultural site of Feiligang, Xinzheng, which is a testament to its 8000-plus-year history of production in China. Red dates contain some invaluable minerals. Along with very high amounts of vitamin C, Red dates contain many important vitamins from vitamin B complex family, like vitamin B1, vitamin B2 and vitamin B6. Jujube fruit benefits are more significant because of the presence of the important minerals in the jujube fruit. These minerals include – manganese, potassium, iron, calcium and phosphorous. Along with the above mentioned nutrients, jujube fruits are also loaded with 18 out of the 24 important amino acids. Red date benefits the formation and maintenance of the blood stream, body hor-mones, bones, muscles, skin, hair, body enzymes and neurotransmitters. Benefits of jujube fruit are also found in the formation of more than 50,000 proteins of the body.